I made this sauce tonight after work- it doesn’t take long and it is SUPER delicious, hearty, and satisfying. The tempeh offers added protein- 14 grams per serving… For those who are not a fan of tempeh or are wary, it’s a good way to introduce it, for those who love it, you can’t go wrong with this sauce. This is also a good recipe to double and freeze to have on hand at a later time. Feel free to add fresh or dried herbs into the mix! In a heated skillet, add the olive oil, salt, pepper and chipotle powder and sauté just until aromatic and golden. Add in the tempeh and pan fry until browned and crispy- about 5-6 minutes, stirring frequently over medium high heat. Set aside. In a large pot, add the olive oil and sauté the onions and garlic with the sweetener until golden and soft. Add the tomatoes, salt, black and red pepper. Add the water and allow the sauce to come to a boil. Reduce heat and simmer for 35-45 minutes or until the sauce has thickened. In the last 5 minutes of cooking, adjust the seasonings. Add in the tempeh. Serve over any kind of pasta or grains. Super satisfying. 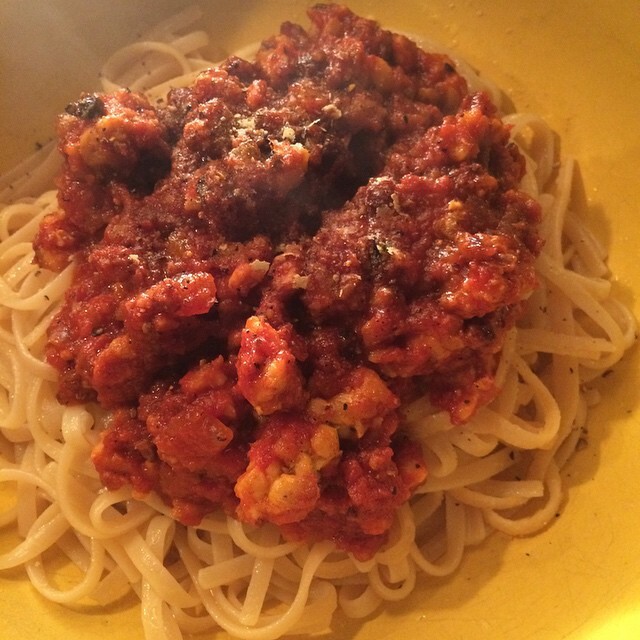 This entry was posted in early fall, Gluten Free, pasta, spreads and sauces and tagged gluten free, no meat sauce, THE VEGAN LOVE PROJECT, vegan pasta sauce, vegan protein, vegan red sauce. Bookmark the permalink.